NEW YORK (September 20, 2016) – Since last year, twice as many of the nation’s top fast food chains are responding to the public health crisis of antibiotic resistance by adopting strong policies that prohibit the routine use of antibiotics, or medically-important antibiotics, in the meat and poultry they serve. This is according to the second annual Chain Reaction report and scorecard, released today by a group of consumer, environmental and health organizations, which grades America’s top 25 restaurant chains on their policies and practices regarding antibiotics use and transparency in their meat and poultry supply chains. The nine chains earning passing grades are Panera Bread (PNRA), Chipotle Mexican Grill (CMG), Subway, Chick-fil-A, McDonald’s (MCD), Wendy’s (WEN), Taco Bell (YUM), Pizza Hut (YUM) and Papa John’s Pizza (PZZA). Today’s report, Chain Reaction II: How Top Restaurants Rate on Reducing Use of Antibiotics in Their Meat Supply, is being released amidst a public outcry from consumers and shareholders urging chains like KFC, Olive Garden and In N Out Burger to adopt policies prohibiting the routine use of antibiotics in the meat and poultry they serve. The results from Chain Reaction II come one day before a high-profile meeting of the United Nations General Assembly on antimicrobial resistance, a major global health crisis caused by the misuse of antibiotics by the medical community and livestock industry. 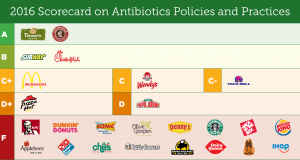 Panera and Chipotle continue to lead the pack with solid “A” grades for implementing comprehensive policies that restrict antibiotics use across their meat and poultry supply. Nine of the surveyed companies — twice as many as last year — received passing grades, largely due to their transition to chicken raised without antibiotics or chicken raised without medically-important antibiotics. The restaurant chains surveyed this year made little progress on beef or pork. McDonald’s earned an improved grade of “C+” this year, after completing its 2015 commitment to end the use of medically-important antibiotics in its domestic chicken supply — with 100% of the chicken at its 14,000 U.S. locations meeting this standard. But the company has yet to take action on beef or pork. Subway improved the most, leaping from an “F” in 2015 to a “B” in 2016. Last fall, under pressure from the coalition and consumers, the chain committed to ending the use of antibiotics across its entire meat and poultry supply by 2025. Very few other chains—and none at this scale—have taken such a strong stance. Implementation of new policies for chicken began this year, but not turkey, pork or beef. Dunkin’ Donuts was the only company to be downgraded to an “F” this year after weakening its publicly stated antibiotic policy. The following chains also received an “F,” either for having no disclosed antibiotics use policy or for having policies that allow for the continued routine use of antibiotics in the production of the meat and poultry they serve: Applebee’s, Arby’s, Buffalo Wild Wings, Burger King, Chili’s, Dairy Queen, Denny’s, Domino’s, Dunkin’ Donuts, IHOP, Jack in the Box, KFC, Little Caesars, Olive Garden, Sonic and Starbucks. Research for the Chain Reaction II report, including the survey of the top 25 U.S. restaurant chains, was compiled by the Natural Resources Defense Council, Food Animal Concerns Trust, Friends of the Earth, Consumers Union, and Center for Food Safety. “This year’s progress is encouraging, but companies and consumers can only move the dial so far – it is time for the U.S. government to step up and mandate reductions in antibiotic use for the industry writ large. Without strong, enforceable regulations for antibiotic use in place, there is undue burden on the public to hold companies to their commitments, and to pressure the laggards in the industry to stop dragging their feet,” said Cameron Harsh, Senior Manager for Organic & Animal Policy, Center for Food Safety. More than 70 percent of medically-important antibiotics in the United States are sold for use on livestock and poultry. More than 96 percent of those drugs are routinely distributed in feed or water—often to animals that are not sick to speed up growth and help animals survive crowded and unsanitary conditions on industrial farms. This practice contributes to the growing epidemic of drug-resistant infections in humans. Leading medical experts warn that we must stop overuse of antibiotics in human medicine and animal agriculture, or else the life-saving drugs we rely on to treat common infections and enable medical procedures could stop working. Conservatively, at least 2 million Americans are infected with antibiotic-resistant infections every year, and at least 23,000 die as a direct result, according to the Centers for Disease Control and Prevention. Earlier this year, scientists discovered a gene which allows bacteria to resist colistin–an antibiotic used as a last-resort when all other antibiotics fail–in the U.S. for the first time, raising the spectre of a kind of “super-superbug,” resistant to every life-saving antibiotic available. The Natural Resources Defense Council (NRDC) is an international nonprofit environmental organization with more than 2 million members and online activists. Since 1970, our lawyers, scientists, and other environmental specialists have worked to protect the world’s natural resources, public health, and the environment. NRDC has offices in New York City; Washington, D.C.; Los Angeles; San Francisco; Chicago; Bozeman, Montana; and Beijing. Visit us at www.nrdc.org and follow us on Twitter @NRDC. Food Animal Concerns Trust is a national nonprofit organization based in Chicago that promotes humane and healthy farms through science-based advocacy, consumer education, and support for humane farmers. Our mission is to improve the welfare of food producing animals, broaden opportunities for humane farmers, and address the public health problems that come from the production of meat, milk, and eggs. FACT has advocated eliminating the over-use of antibiotics in food animals for over 20 years. Consumers Union is the public policy and advocacy division of Consumer Reports. Consumers Union works for health reform, food and product safety, financial reform, and other consumer issues in Washington, D.C., the states, and in the marketplace. Consumer Reports is the world’s largest independent product-testing organization. Using its more than 50 labs, auto test center, and survey research center, the nonprofit rates thousands of products and services annually. Founded in 1936, Consumer Reports has over 8 million subscribers to its magazine, website, and other publications.